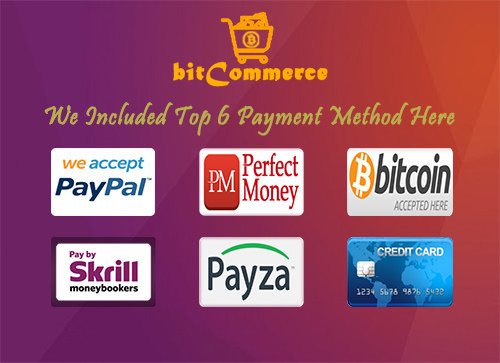 bitCommerce is Powerful and Complete Solution for Bitcoin wise Any kind of eCommerce Business. You can Easily Start a eCommerce Business just a few click. This scripts has most powerful 6 Payment method like (Paypal, Perfect Money, Bitcoin, Skrill, Payza, Stripe).Its 100% User friendly and fully Responsive in all kind of Device. Here have also a Staff Panel, where a staff easily Add Product and Manage Added Product.Its Very easy to use and SEO friendly software. Admin can manage complete website without single line of coding knowledge.It is professionally developed in PHP based Laravel framework with MySQL backend.It has strong SQL injection protection system which will keep away this system from hackers. This script creates an unique session for each login every time and checks login session is valid with this system or not. So there is no question about session hijacking. ✓ Order Automatic cancel After Expire time. ✓ Multiple Ads Show Place. ✓ Product Send Friend Via Email. ✓ Easily Add Product to Cart. ✓ Easily Add Product to Wishlist. ✓ Easy to Submit Rating. ✓ Easy to Submit Comment. ✓ User Profile Edit Easily. ✓ User Update Password Easily. ✓ User Social Link’s Management. ✓ Easily Publish Product and Edit. ✓ Manage Order Expire Time. ✓ Easily Manage Payment Method. ✓ Easily Manage Payment Charge. ✓ Admin Profile Edit Easily. ✓ Easily Manage Logo, Favicon & Preloader Image. ✓ Manage Live Chat Scripts. ✓ Frontend Base Color Manage Using Color Code. We are always Offer Free Installation. Just E-mail us with Your Product Purchase Code and cPanel Access. We Install your Product So Fastly.